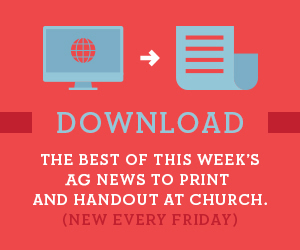 Multiple resources for the Assemblies of God annual Week of Prayer, Jan. 6-12, are now available to download for free. Assemblies of God General Superintendent Doug Clay shares the Saturday emphasis for the 2018 Week of Prayer. Assemblies of God U.S. Missions Executive Director Malcolm Burleigh shares the Friday emphasis for the 2018 Week of Prayer. Assemblies of God World Missions Executive Director Greg Mundis shares the Thursday emphasis for the 2018 Week of Prayer. Assemblies of God General Treasurer Rick DuBose shares the Wednesday emphasis for the 2018 Week of Prayer. Assemblies of God General Secretary James Bradford shares the Tuesday emphasis for the 2018 Week of Prayer.